Nadodi, Kuala Lumpur : Nestled in the heart of Kuala Lumpur, Indian restaurant Nadodi is using modern gastronomic techniques to elevate the traditionally rustic fare of India's south. It offers a variety of tasting menus - including a vegetarian option. Once you let the meaning of the word simmer in your mind for a while, you'll realize Indian restaurant Nadodi could have no better name. A word that translates to "nomad" in a couple of South Indian languages, it harks to the journey the people of that region took to faraway lands, such as Malaysia, where this eatery is located. It's also laden with history; forced migrations of laborers by British overlords, opportunities sought by intrepid traders or movements of civil servants seeking new pastures. Nadodi is also a story of how food itself travels-- how generations of migrants and travelers bring their culture and cuisine to alien lands, contributing to the melting pots of the nations they become part of. And, it's the story of the founders of Nadodi themselves -- South Indian nomads who, as children, were away from their ancestral lands, growing up in places like Kolkata, Mumbai and Delhi; and who, as adults, found their travels eventually landing them in Kuala Lumpur. Kartik Kumar, the restaurant's brand director, recalls how he and chef de cuisine Sricharan Venkatesh and mixologist/operations manager Akshar Chalwadi initially wanted to call the restaurant "Cinnamon." "But when we arrived in KL, and started to eat street food and dishes in restaurants, we realized the names [of the dishes] were very familiar -- we had eaten them in the southern part of India, in Kerala, Tamil Nadu - even in Sri Lanka," he says. "All these things inspired us to think about how this happened and how this food arrived all the way in KL." However, Kartik and Sricharan both credit Anand, whose restaurant is frequently listed as the best in Asia and among the best in the world, for changing the way they think about food. 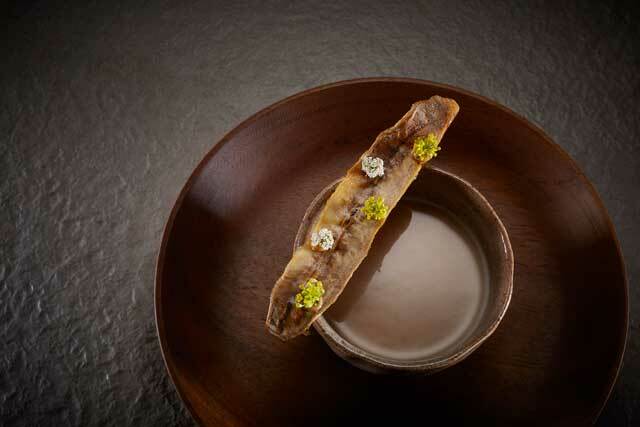 "We have a lot of love and respect for Chef Gaggan. When I joined Gaggan, everything changed for me," Kartik says, citing the Bangkok restaurateur's use of fresh produce, experimental gastronomy techniques and plating as inspirational to his own growth. The influence is clear in Nadodi's approach to dining: they source their crockery from an artisan in Kuala Lumpur and their produce is supplied by hand-picked farms around the city; the restaurant's latest discovery is a farmer who raises milk-fed goats, which they plan to use in future dishes. It's an approach that has already won them numerous accolades, including Tourism Malaysia's coveted "Most Innovative Restaurant" gong. "Our flavors and profile are South Indian. Our presentations are South Indian. There's no comparison [with Gaggan]," Kartik insists. "Nadodi is a different concept, which does only South Indian food. I'm not doing the chicken tikka or the naan over here. I'm giving you rasam, I'm giving you crab curry... this is true to the place we belong to and that's what Nadodi will stick to." Elevating South Indian food is a particular mission for Kartik, Sricharan and Akshar. "There are so many Indian restaurants out there doing Indian fine dining, but none exclusively focused only on South Indian food," says Akshar. "Even in India, it's usually just dosa [rice flour crepes] or vadai [fritters]." Kartik feels the perception of South Indian food needs to change. "With European food, they have taken a lot of pride. I personally believe with our cuisine and culture, we are too hungry to feed ourselves. We never cook for others," he says. "But you tell me: fermentation, our forefathers were doing it. That's how we got idli [steamed rice flour cakes] and dosa. What is poppadom? It's dehydration. What are the pickles? Those are preservatives. "So we have been taught preservatives, fermentation and dehydration long ago. But we will excel and take the pride of our techniques and present it to the world." What does the country need to do to get to the level of regional fine-dining hubs like Singapore and Bangkok? "KL is still evolving and is a small market when it comes to fine dining," admits Kartik. "Few people appreciate fine dining. The support from the consumers over here in KL, that needs to be brought up. "And probably an initiative needs to be taken by Tourism Malaysia to support restaurants trying to make KL a destination for fine dining. In terms of (food) varieties, Malaysia has plenty. But It has to be packaged and presented well." Read the original article on CNN Travel here.